In response to cat owners' concerns....The Safe Cat buckle is designed to release when a cat's collar gets caught- allowing it to slip free. 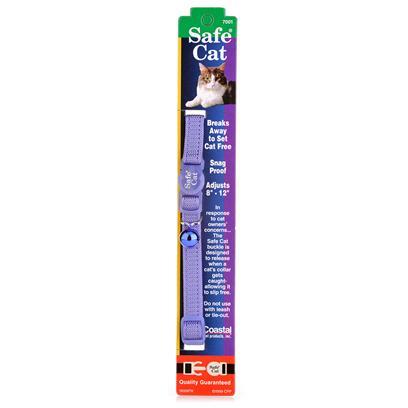 Keep your cat safe with a Safe Cat Breakaway Collar. The Safe Cat Breakaway collar is made of no-snag material and is also adjustable from 8" to 12". Do not use with lead or tie-out. - Collar adjusts from 8" up to 12"